Look through a different frame for sales using a visualisation technique that works great for retail sales or lower priced products. When your customer has a mental list of reasons why they can't buy a product this technique will tip the scales in your favour. You'll learn a simple way to outweigh their negatives with your positive reasons to buy. Plus, this sales training technique is also a nice mental exercise that shows you how visualisation can re-frame your perception and connect you with your sub-conscious. Imagine your sales prospect, or retail customer, has in their mind a list of reasons why they can't buy from you. Perhaps you can remember a time when you've done this yourself. At work or passing a shop or showroom window, you see something that you want, but you tell yourself all the reasons why you can't buy it. Now picture the list of reasons not to buy that your customer could have weighing down on one side of a set of scales. There are two ways to see those scales tip the other way, in your favour, which will lead to you closing the sale. One way is to tackle the reasons not to buy as you do objections. But using a sales objection process can be very slow. It's not always suitable in a quick retail sales process, or when selling low priced products. Just questioning the objections might scare away the buyer. And even if you do succeed you have only levelled the scales by taking those reasons away and then you have to start tipping them in your favour. 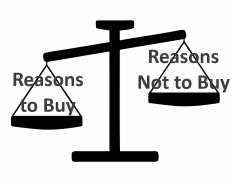 The second way to tackle these reasons not to buy, on your buyer's imaginary scales, is to outweigh them by stacking up reasons to buy on the other side of the scales. And in retail and low priced product selling this, for me, is the one that works. You're now starting to see the process of selling in certain situations through a different frame for sales. To tip the scales your way you need to stack up reasons to buy that far outweigh the reasons not to buy. And as you visualise your progress you'll see the scales tipping in your favour. The further they tip the easier it is to close the sale. Picture a set of scales, loaded with lots of reasons a customer may have for not buying. Start to create a stack of reasons why they should buy one of your products on the opposite side of the scales. How will they feel when using I. What's the biggest buzz they will get from it. Think deeper about the good points of what you sell, what's it made of, what do they get with it, what are the good points about the service they receive or the guarantee they get. Keep stacking them up until you see the scales crash downwards on the 'Yes I'll buy it' side. When you've done it a few times as a mental visualisation exercise you're ready to use it while talking to real customers. When you're stacking up the reasons to buy on the scales here's a nice little addition to remember. There will be logical reasons to buy, such as the product last twice as long as competitors, or you will save 10%. And there are emotional reasons to buy, such as feeling really great wearing it, or knowing the family will be safer using it. 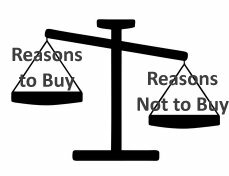 The emotional reasons to buy are much heavier than the logical reasons to buy, and the logical reasons not to buy. Have you ever bought something because emotionally you wanted it, but you knew logically it was wrong to buy it? You couldn't really afford it, or there were more important, logically thinking important, things you should have done with your money. How many people buy a bigger car than they need? That was their emotions outweighing their logical reasoning on the scales of sales. If you can find emotional reasons to buy for your products get them on the scales and see the Buy It side get heavy very quickly. I use visualisation techniques a lot when presenting sales training courses. They work, I've seen this proven many times. They send messages to your sub-conscious about what you want to achieve and what your goals are. As an exercise they're nice to do, they can be relaxing and have a calming effect in a fast moving sales world. I hope you enjoy using it. Exercises like this give you a different frame for sales, a different viewpoint on how you get a prospect to agree to buy from you. These techniques are not meant to replace having a good Sales Process. They are meant to be added to how you sell and the skills you already have.